Source of title proper: The title of this collection is based on the content of the records. 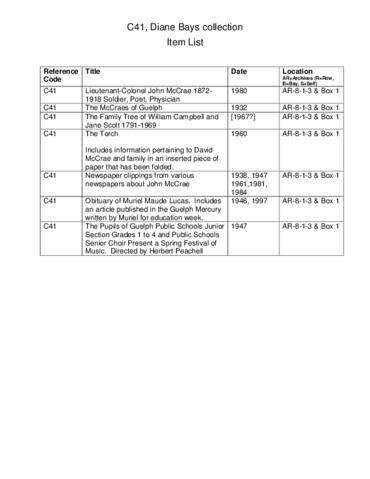 Collection consists of textual records pretaining to the life of John McCrae. Included are the publications Lieutenant-Colonel John McCrae 1872-1918 Soldier, Poety, Physician, the McCraes of Guelph by A.E. Byerly, and a copy of The Torch which includes an inserted piece of paper pretaining to David McCrae's family. There are also newspaper clippings various newspapers about John McCrae. There is not restrictions on access. To access records in this series, consult File List C41 to narrow down your search. Order box 1 from the Guelph Public Library Archivist.